I have a new piece for you! Plus some news, anyone in and around Indy may be familiar with First Fridays. Many studios and galleries around the city are open to schmucks like you and me to check them out. Nov 4th is the next one, and I'm going to be hanging work in Upland's space to show my stuff. There will be free beer and music, so even if you hate my guts it's totally worth it. Plus, this new guy will be there. Pam - these are great. 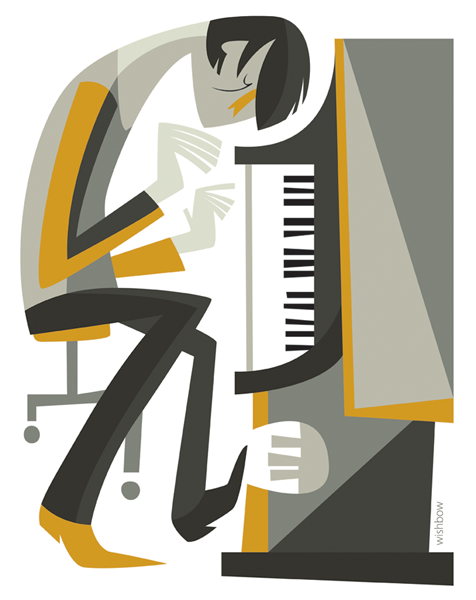 I love the colors and shapes you used, and I especially love how you did the foot pedals on the piano! Hope First Friday goes great!